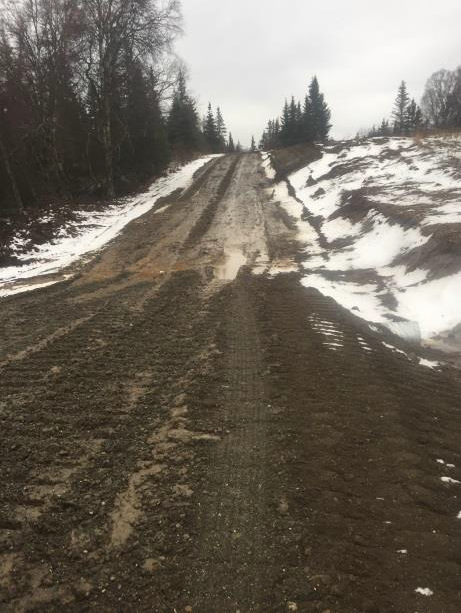 Residents in the subdivisions beyond the end of the Kenai Spur Highway have been waiting for an extension of the road to their properties for two decades. Work continues on the roughly eight mile extension of road beyond the end of the Kenai Spur Highway in Nikiski. The long anticipated project will provide access to the Gray Cliff subdivision, currently only accessible by all-terrain vehicles. Kevin Lyons, the borough’s capital projects manager, told the borough Policies and Procedures Committee this week they have just a couple miles left to clear. Some of those improved materials come in the form of geo-grid, the matting used to help keep soils stable in those work zones. Work on Jacob’s Ladder Drive will start when crews get past approximately mile four of the extension. The full 8.2 miles is expected to take some 300,000 cubic yards of gravel. Federal dollars were set aside for this project two decades ago, but the bureaucratic hurdles were only finally cleared early last year. Work will continue until that initial $6 million runs out. While the Kenai Peninsula Borough survived the Nov. 30, 7.0 earthquake and subsequent aftershocks in rosy condition compared to Anchorage and areas of the Matanuska-Susitna Borough, it didn’t escape unscathed. Damage reports are still coming in and the repair bills are adding up. The borough assembly will see an ordinance at its meeting Tuesday asking to appropriate $450,000 to cover repair and inspection costs already incurred and more yet to come.